It's not exclusive is they just reissue it. They need to stop with all this merchandise already. Tell that to Capcom of USA/Capcom of JAPAN FORUMS there! They are being annoying with those garbage merchandise and make a mega man games already! You can also order them on amazon. It's a nice statue and all, but $124.99 is what they're charging for it? Give me a break. Give me a break!! They are doing it to steal your money instead of making new megaman games! Dont pay them! Capcom of USA/Capcom of JAPAN, listen to us and do it or no profits to you! SIGHING! 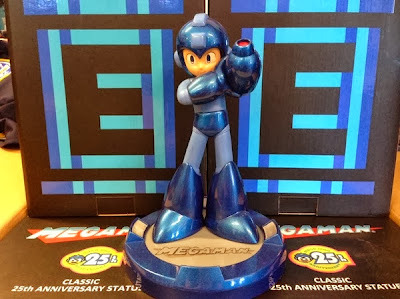 If Mega Man products do not bring in money, they will stop doing Mega Man all together. Merchandise is the only thing keeping it afloat. If this mindset is actually true then this will be cemented in my mind as the worst anniversary celebration for any video game series ever. Nevermind the fact that it just sounds dumb. "Buy all this merch that supposedly celebrates this series and you might get a new game eventually. Otherwise you get nothing." Gonna have to pass on that offer myself. There are...2000, WGAS? I thought it was limited to 1000 pieces produced. Since this is supposed to be a "collectable" anniversary statue, then it should remain limited to its original run. That's it. It's part of the reason most of us shelled out the money for it originally; to be a proud owner of this pretty impressive statue. It's part of its coveted allure. If they make more of them, then they'll just be a common product anyone can get. Merchandise is cool and all, and it's nice more fans have access to this, but instead of making more of the supposedly "limited", "special" pieces, Capcom should try actually making a game that would be worthy of that 25th Anniversary emblem. They are really boring with the goodies, Capcom is hypocrit.....I dont need the last toys or others things like that, i will buy only the old official goodies (good old times). They are really foolish. I wont buy anymore, i will buy just if there is an official game. (and a good one, not like SFxMM, free but not really so good. Oh was it 1000? I forgot. I don't see any reason for people to be upset about this, the only reason the first run of the statues sold out so fast was because of the price scalpers who bought multiples of the statue and are now listing them on ebay for $300 and up. I would rather pay $25 extra then to pay $200 extra because I sure would not pay $300 for the statue knowing that the original price was $100.